CRG's journal was founded in 1998 to document the flows of forced migration with a focus on South Asia. Innovative in it's creation, Refugee Watch continues to be an important space for the discussion of displacement and forced migration. CRG maintains an online co-publication of Refugee Watch, which presents brief news, reports, views, and comments to draw political and social attention to the human rights of the forcibly displaced. CRG publishes a series of research papers with the aim of disseminating important work and findings for discussion among scholars, researchers, policymakers, practitioners, and activists. CRG has published an impressive and extensive range of books, including monographs, readers, and edited volumes. CRG's Distinguished Lectures have brought some of the world's leading scholars to present their work in kolkata, including Etienne Balibar, David Ludden, Walter Kalin, and J. Peter Burgess. 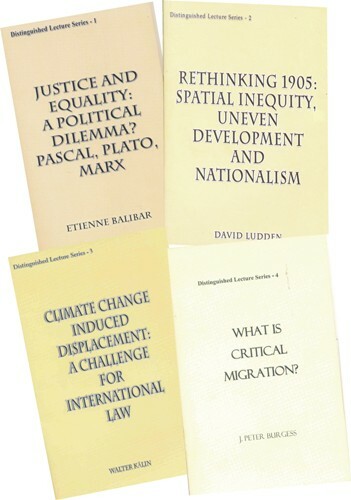 These lectures have been published by CRG. Other CRG lectures series include Jayanta Dasgupta Memorial Lecture on Labour, Krishna Memorial Lecture on Girl Child and Friday Lecture for young researchers. CRG publishes reports about each of its research projects as well as conference reports, which all are made available online.